Dorm Co. Tip: Keep your scarves, leggings, pants, ties, and other dorm essentials organized on one dorm hanger! Dimensions: 16.5" x 12" x 1"
There are going to be some dorm items that you won't be able to fold up and put in your dorm dresser or on a college shelf. You may have dress pants or leggings that need to be on a dorm hanger but you want to save as much space as possible. You don't want to place each small dorm accessory on a separate dorm hanger. That will take up a lot of valuable dorm room storage space. 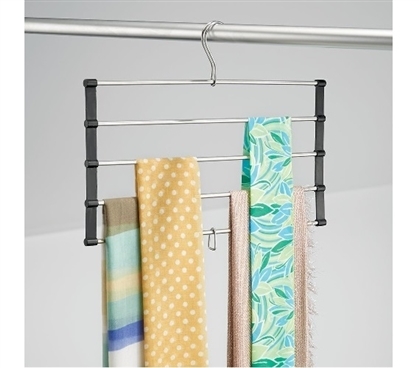 Instead, place those fragile dorm essentials on our 5 Bar Dorm Accessory Hanger in Black! 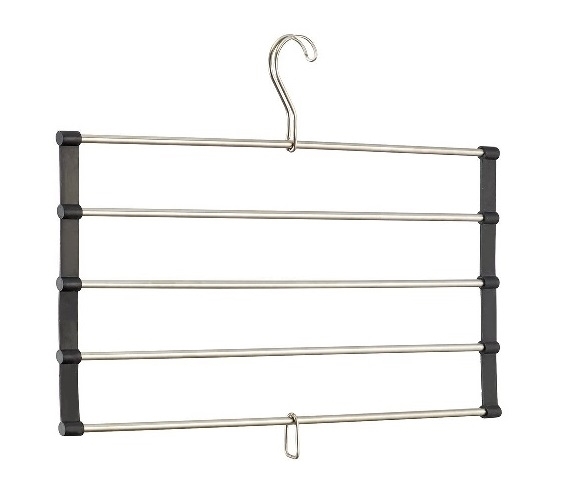 Our 5 Bar Dorm Accessory Hanger in Black is a dorm necessity that is a dorm space saver. It has a unique design that allows it to be rolled up when not in use. That means this closet organizer is extremely compact and can be placed in any free space you have in your car or dorm luggage. Plus, you can also use this dorm hanger when camping or traveling - with how compact it is, it won't take up much space and will instead give you plenty of dorm storage. This closet organizer has five bars so you can keep your leggings, ties, dress pants, scarves and more organized and neatly stored. On the bottom of this dorm organizer is a hook that allows you to connect multiple dorm hangers together which will save you tons of closet space!